Compressed alcohol gas has become the favored calibration standard to maintain the accuracy of breath testing instruments. Compressed gas has several advantages compared to simulators, the only other method of producing an alcohol standard. Compressed gas is portable, does not need AC power, is instantly ready to use (see below for the exception), has relatively long shelf life, and is easy to use. However, there are several key issues that breath alcohol operators must know about alcohol gas standards to ensure they give accurate results. 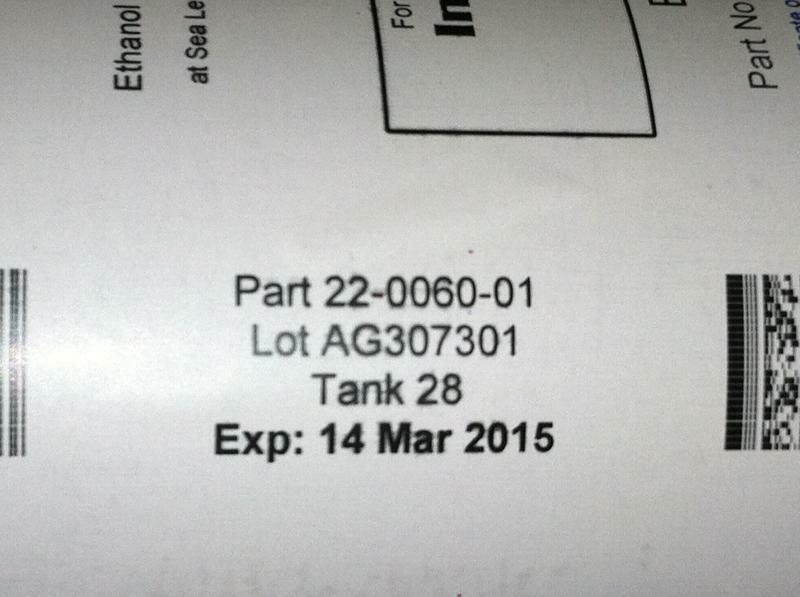 Manufacturers of alcohol gas standards stamp an expiration date on the label of every tank. The manufacturer is essentially guaranteeing that the alcohol concentration will remain the same for the duration of the shelf life, which is usually about 18 months to two years. There is no guarantee that a tank used after the expiration date will have the same alcohol concentration specified on the label. In fact, at some point after the expiration date the true alcohol concentration of the gas will decrease and will no longer be the same concentration as on the label. An operator who uses a tank after the expiration date cannot have any assurance about the accuracy or validity of calibration verifications or adjustments. The readings that compressed alcohol gas give depend on barometric pressure. Elevation is the biggest influence on barometric pressure. As elevation increases, barometric pressure goes down. The difference can be very minor at elevations less than 1,500 feet, but the difference becomes significant at higher elevations. For example, a tank that reads .038 at sea level (zero feet elevation) will read .031 at 5,250 feet elevation. 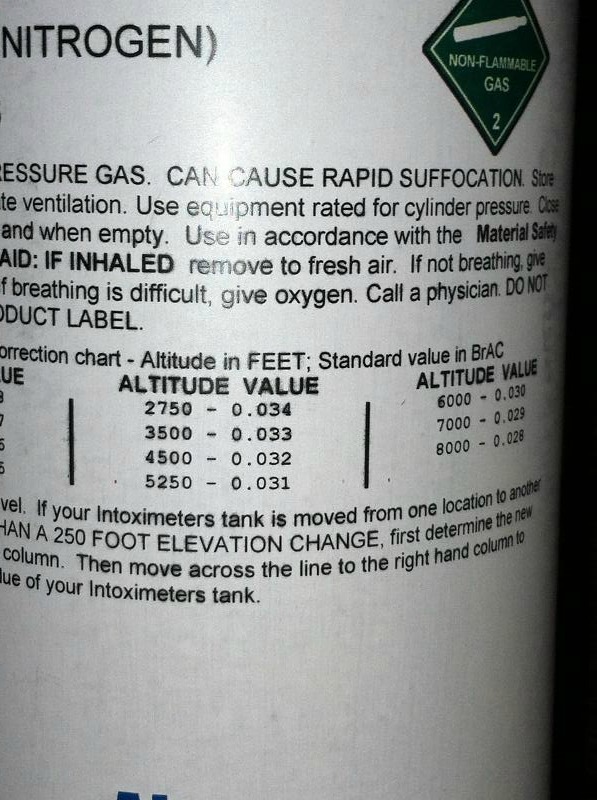 Operators must consult the altitude conversion chart on every tank or use a device like the True Cal II that reads barometric pressure and displays the alcohol concentration. A few instruments, such as theAlcomonitor CC and Alco-Sensor VXL, have built-in barometers and automatically calculate the true alcohol concentration without operator intervention. An operator who relies only on the alcohol concentration written on the label of the tank and does not make the appropriate adjustment for elevation will not maintain an instrument in accurate condition. Compressed ethanol gas will condense into a liquid state if the tank gets too cold. The temperature at which this happens depends on the alcohol concentration and the pressure. In general, temperatures around freezing will cause the ethanol to condense, changing from a gas to a liquid. As the tank warms up the liquid ethanol will change back to a gas. However, if the operator were to use the tank before the tank has warmed and the liquid ethanol has changed to gas, the proportion of ethanol and nitrogen will be permanently changed. 2) Once the tank warms and the liquid ethanol returns to gas, the tank will always give a higher alcohol concentration because the proportion of nitrogen to ethanol has changed – there is now less nitrogen and more ethanol. An operator who uses a tank in freezing temperatures may permanently alter the alcohol concentration of the tank, and the tank will no longer give accurate readings.